The 4200 N95 AirWave Disposable Respirator features patent-pending technology that allows workers to breathe easier with cool comfort. 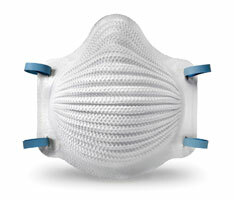 It is ideal for when unvalved respirators are preferred. The FlexFit design expands and contracts as a user moves or speaks. A pinch-free molded nose bridge eliminates discomfort.